The Nerd Nook: League of Extraordinary Bloggers - Whaddaya Want?! League of Extraordinary Bloggers - Whaddaya Want?! The collecting community on the interwebs is an awesome bunch of people. I've connected with great folks through forums, Facebook, youtube, Instagram, and of course the League of Extraordinary Bloggers! The level of passion and love we've got for all facets of pop culture is inspiring to say the least. We'll search high and low to find that perfect item to complete a collection or a display. This week's assignment is all about he hunt. "When we're out at yard sales, flea markets, conventions, and more.....what are you hunting for?" Now that the good vibes have been satisfied I get to the actual digging. I love to collect all sorts of pop culture stuff. I have loose figures, loads of LEGO Mini figs, and all sorts of other stuff. With that said, my serious collection, that I spend the most time working on, is my Super Powers Collection. I always make a quick run around to see what Super Powers stuff I can find. I waiting for that day when I come across a real gem. One can hope! Once I've scoped the scene for Super Powers, it's on to Masters of the Universe and Thundercats. I've got small loose collections of these that I'm working on. If I can find complete figures for cheap I'm all over it! At Retrocon a few weeks back I scored that complete Skeletor in the photo. Finally, I go after the random. Whatever coolness catches my eye. 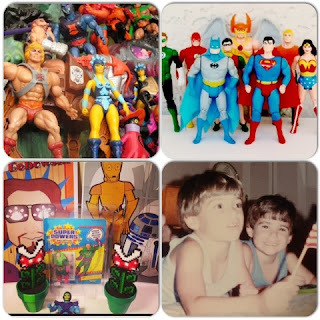 For example, the bottom left photo is my haul from Retrocon. I scored a Super Powers Lex Luthor on a card back I didn't have yet. The Skeletor I mentioned, then the random. I picked up two cool posters from a guy who created. One Big Lebowski (love that movie) the other of everyone's favorite Droids! Finally I picked up a pair of piraña plants, custom made! Too cool to pass up. So there you have it. My hunting goals and motivation...if you could call them that! Next weekend is a huge one! I can't wait for it! Friday I have New York Comic Con. Saturday a local shop is having a pre Christmas blow out sale to make room for new stuff. Sunday is a toy show. Monday is Columbus Day to kick back and recharge after an awesome, nerd filled weekend! Stay tuned for reports and hauls from that weekend. League updates to come! The piraña plants are awesome! I'm jealous. I'm very jealous. Ha, I saw them an snatched up two fast! An hour into the convention and he only had one left! Looks like a good stack o' He Man! I never had any He Man as a kid, which is why I try to keep an eye out for it. They are classic toys and pretty cheap loose. Happy hunting! I didn't do a post this week. My Wednesday posts are all about that! League of Extraordinary Bloggers - Halloween! Creepy Countdown Day 5 - Madballs! Creepy Countdown Day 4 - Imperial's Monster Toys! Creepy Countdown Day 3 - Monster Face! Creepy Countdown Day 1 - Boogedy Man!